Nowadays, everyone uses external storage for storing the data. This process is same with Mobile Phone or Computer. If someone uses Mobile Phone, then he uses Memory Card as An external storage. And if someone uses Computer or PC then they merely use pen drives or hard disk as an external storage. The common issue with all is when someone inserts their external storage device(Pen Drive or Memory Card) in pc then sometimes we get a notification as "Please Insert a disk Into USB Drive (G):"
And after that when we try to Format that drive we get a new notification "Windows was unable to complete the Format." So in today's topic, we'll discuss more how to repair corrupted the data storage devices. Because Most of the time someone who uses the storage devices and they save their most dearest data in that device and they found they are no longer to access their data. And they think the storage device has been corrupted and they will never access their data. That's by in today's topic we'll help you to recover your all data and make your storage devices in working condition. So let's move towards the solution. Go to "Start" menu and search there for "CMD"(Command Prompt). Now click on this with "Right Side Button" and Choose "Run As Administration." Note: Apply all codes as shown in the below image. So make sure everything(Code) is correct. A CMD(Command Prompt) window will open. In the given prompt, place all codes carefully If you have any problem then make a look on the image given below. Type 'diskpart' and hit Enter button. Type 'list disk' and hit Enter button. A list of all the storage devices connected to your computer will be displayed in the Command Prompt. Type 'select disk' <the number of your disk> (You have to keep in mind about the disk space of your memory card or pen drive) and hit Enter button. (Example: select disk 0, select disk 1 or select disk 2). Important Note: Make sure you enter the number correctly. Otherwise, you may format your internal hard drive. You must check the device size before selecting. In the next steps, place all codes carefully. Type 'active' hit Enter button (DiskPart marked the current partition as active) then. 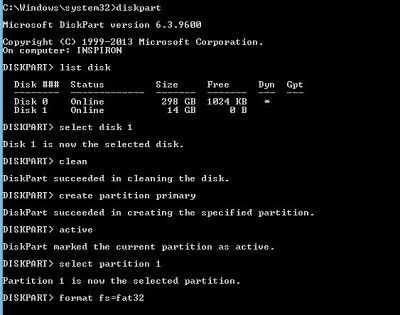 Type 'select partition 1' hit Enter button(Partition 1 is now the selected partition) then. Type 'format fs=fat32' and hit Enter button. The format process will finish in a few minutes. Type 'exit' and hit Enter button. Start using your corrupted memory card or pen drive. Subscribe "SwisterNews" by scrolling down till last and put your e-mail address there. You must verify the system generated e-mail sent to your email id. You can also Find "SwisterNews" on Youtube, Instagram, Facebook and Twitter.